Describe or photograph your favorite kluge! A clumsy or inelegant solution to a problem. Kluges are everywhere (including the human mind). 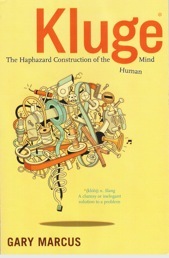 Join Houghton Mifflin and SEED Magazine in celebrating the upcoming publication of Kluge: The Haphazard Construction of the Human Mind, by Gary Marcus. To enter, prepare an essay or picture (or a song or even a video) and submit it using this form. No purchase necessary to win. All entries must be received by June 15, 2008; entries received before May 1st, 2008 are eligible for Bonus Prizes.